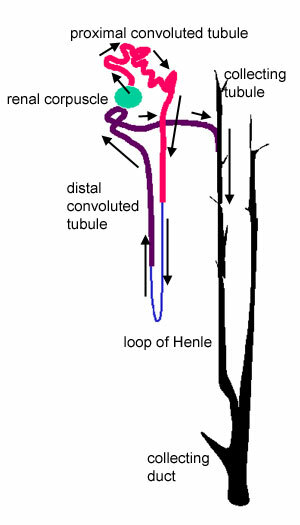 The nephron consists of the renal corpuscle and the renal tubule. The nephron is responsible for filtration, excretion and resorption. It filters out small molecules from plasma, selectively re-absorbs most of the water, and some of the molecules, and also secretes some secretory products into the filtrate. The end product is urine. 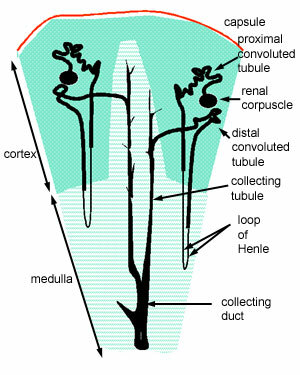 This schematic diagram shows where the different parts of the nephron are found in the cortex and medulla of the kidney. Filtration of the blood plasma takes place in the renal corpuscle. This is the proximal end of the nephron, which is expanded into an ovoid structure. The renal corpuscles are always found in the renal cortex. Here a compact mass of looped fenestrated capillaries called the glomerulus (latin for 'small ball') is encapsulated by the proximal end of the renal tubule ('Bowman's capsule). The beginning of the distal convoluted tubule is found close to the renal corpuscle, in a structure known as the juxtaglomerular complex. 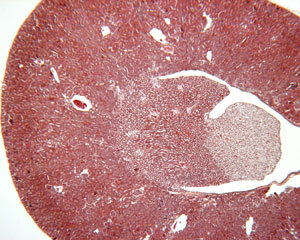 This shows an H&E stained section of the kidney. You should be able to identify the cortex and the medulla. Notice that they look different in structure. The medulla is full of renal tubules, but does not contain renal corpuscles. All the renal corpuscles are found in the cortex.